"Truthers commemorate 9/11 with Times Square ad showing WTC 7 imploding on infinite loop"
A group calling itself Architects & Engineers for 9/11 Truth is commemorating the thirteenth anniversary of the attacks on the World Trade Center by displaying a massive digital advertisement in Times Square that purports to show World Trade Center 7 (WTC 7) falling in a controlled demolition. “WTC 7 came down in a classic controlled demolition,” the advertisement claims. “The government says fire brought it down, but anyone who watches the video can see otherwise.” Behind those words, video of WTC 7 falling repeats on a loop. The digital advertisement is 15 seconds long, and will be displayed on 45-foot by 45-foot screens that will be visible, the group claims, to almost 100,000 people daily — including employees of The New York Times. 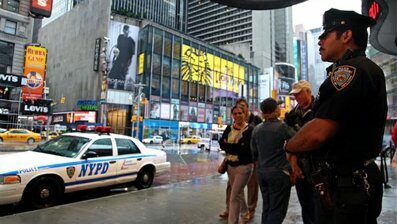 A small explosive device rocked New York's Times Square early today, causing minor damage to a military recruiting station.